My association with this scenic state, God’s Own Country, has begun almost a decade ago. And it continues. I always look forward to being here on one occasion or another: this place with its pristine pleasures of nature always rejuvenates. Here the people’s simplicity humbles me, their affection engulfs me, their learning challenges, their commitment inspires, their dedication goads me to view the world in a different light—a better and brighter light. No wonder, I am delighted once again to be before you; more particularly amid the bright and brilliant future architects of this nation, you, the graduates. My delight has a person angle, too, for I was once the Chancellor of this Seat of Learning. Everything changes and nothing remains constant. Perhaps change alone is constant. But through this long, unending thread of change, one theme runs deep and uniform. Whatever be the change, its proclivity is to travel towards the better shores. And those who accept the challenges this change throws at them will always emerge victorious. This battle of future and for future needs a fine-edged weaponry: the weaponry of knowledge and dedication. I believe this University in these five years has given you the introduction to the knowledge part, leaving it for yourself to acquire the rest. Dedicate yourself to the cause you are ordained to embrace—the legal profession—and the world belongs to you. Its your oyster, literally; you can find the pearls of fortune, aplenty. Let me tell you a truth that is almost a truism—Great people are not born great; they grow great. To illustrate, I may tell you an anecdote: When Albert Einstein, one of the greatest intellectuals this world has ever seen, was a schoolboy, he dreamt of joining a science course. In the united Germany, then, to join polytechnic, he had to face an entrance, in which Latin was a compulsory subject. Einstein was weak in Latin. He did take the entrance, and he failed. He had the ambition of becoming a great discoverer of universal truths. All that he had to do was abide by it. He did. And the huge world came round to him. Many people pass into the oblivion of past; only a few make history. The time you spent uneventfully is past; the time you spent achieving great things is history. Decide for yourself whether you want to be a mere speck of insignificant dust, called accidental existence, of the past, or an eventful maker of that past—a history maker, as an Einstein did, as a Gandhi did, as a Krsihna Iyer did, as a Palikivala did. About our profession, I may say, in any democracy—a democratic republic at that—the constitution is the nation’s conscience. And the courts are the nation’s conscience keepers. Indeed, courts are made of lawyers, not mere pillars and walls. So you are the nation’s conscience keepers, truly. Indian history bears out one fact: this nation’s tryst has been with lawyers and legal profession. If we want to be proud of or ashamed of it, it is our choice. To be proud of for the progress the nation has made or to be ashamed of for the snail’s pace at which we are progressing. They are the two faces of the same coin. Largely it was the lawyers that led the nation’s freedom movement; largely it was the lawyers that framed the Constitution; largely it was the lawyers that led the nation initially after the independence. Now, in political sphere lawyers may be a dwindling force, but there is still scope for them to play a vital role. 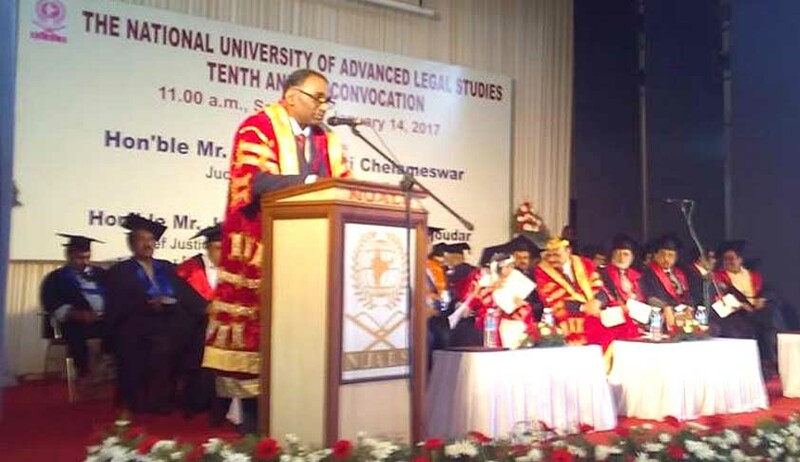 We have the best of law institutions and colleges, as NUALs testifies; we have the best of the legal brains as Alladi Krishnaswamy and M. K. Nambiyar could testify. I can see in you only the future Alladis and Nambiyars. Let me remind you of one thing, for I have referred to two ‘men’ as legal luminaries. Gone were the days when this profession was dominated by men. Now, women have been outperforming men in this field, too. Take heart. This institution has a hoary past. But we all know that time is a tyrant; it stops for none. Under its wheels of change, everything gets crushed. Lofty as this statement sounds, I still reckon our profession carves out an exception: it is insulated in a time warp. Antiquity is its quality. Change it tries to resist, and yields to it very reluctantly. If we take, for example, Medicine, what was practiced 100 years ago could have no resemblance to today’s methods. As to our profession, 100 years is perhaps a mere blink. We cheerily cite the same case law even a 100 years later, for us values are eternal, so are the legal principles, perhaps. About 30 years ago, legal profession had a very rigid system. Everybody had to go through the same grind: join a Senior's office, be an understudy for a decade or so, emerge slowly out of the Senior's shadow, and establish on one's own—it all would take a couple of decades. Access to legal information was not that easy. Nor many advocates could boast of enough resources to buy legal commentaries of value. Now-a-days at a click of a button, we have access to the entire case law of all jurisdictions across the world. But, let me caution you greater access to knowledge is not the same as greater knowledge; an ever-increasing plethora of facts & data is not the same as wisdom; breadth of knowledge is not the same as depth of knowledge; and multitasking is not the same as complexity. With the opening up of the economy, we are now bracing up for the foreign law-firms entering our country. Very soon, the concept of individual advocates may become passé. You need to be with the fittest to survive. Let us not forget that this profession demands from us the ability to marshal facts and law. In other words, analytical ability, astute reasoning, and the art of persuasion are indispensable skills a lawyer must possess. You can acquire them, if only you are willing to look out and learn. Nani Palkhivala co-authored Income Tax Act with his senior, Sri Jemshedji B Kanga. In his preface to the first edition of that book, Palkhivala pays glowing tributes to his senior. Doing so, he recounts what could be the great qualities of a lawyer: “[h]e was a born lawyer and a great advocate, of sure and enormous knowledge, on whose mind, as on a phtogrpahic plate, facts fell in their legal aspect”. We who had the privilege of working with him will always cherish the most loving memories of the man who was as great as the counsel, of his unfeigned simplicity, his innate humility, and his capacity to rejoice at the success of others in the profession (one of the rarest of human qualities). When one man wanted mobility, he invented the wheel. Every next man simply uses that that wheel; rather, the next man does not re-invent it. In our profession, too, you learn quite a lot by imitation. Observe your Seniors and peers, read good books, but always be on the lookout to experiment, explore, and innovate. Imbibe the best of both the worlds: tradition and innovation. Have infinite enthusiasm, infinite daring, and infinite patience. You are bound to scale great peaks of success in life. Let me end my musings with a quote from Eleanor Roosevelt, who once said: The future belongs to those who believe in the beauty of their dreams. We are all unique, but I think the luckiest are those who challenge themselves to dream impossible dreams, make them a reality and ultimately leave behind a legacy.